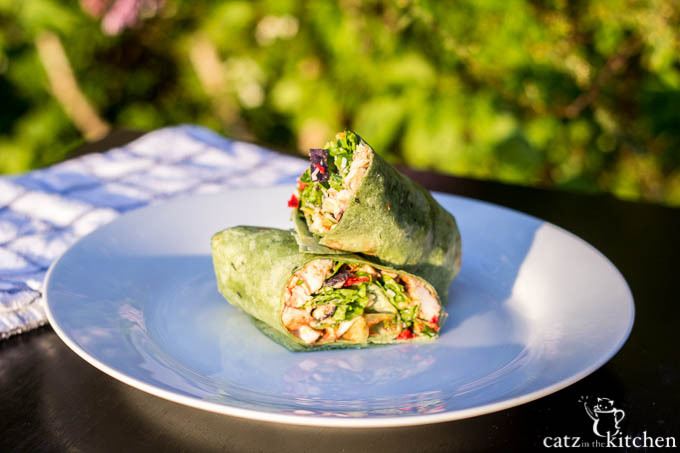 Craving one of Red’s excellent wraps? This Red Robin Whiskey River Barbecue Chicken Wraps imitation recipe is tasty, easy, and takes about 25 minutes to make! We just recently remade these and updated the photos! Good news – they’re still as good as they were back at the beginning of 2013! As regular Catz readers know, Chels and I love to imitate meals we enjoy when eating out. Oftentimes, that means imitating Chevy’s or California Pizza Kitchen, a couple of the casual dining establishments nearby that our whole family can enjoy, but the menu at Red Robin is another one that we enjoy reverse engineering from on occasion. Most people are familiar with Red’s excellent burger menu, due to their national presence, but have you ever taken the time to look at their chicken entrees? 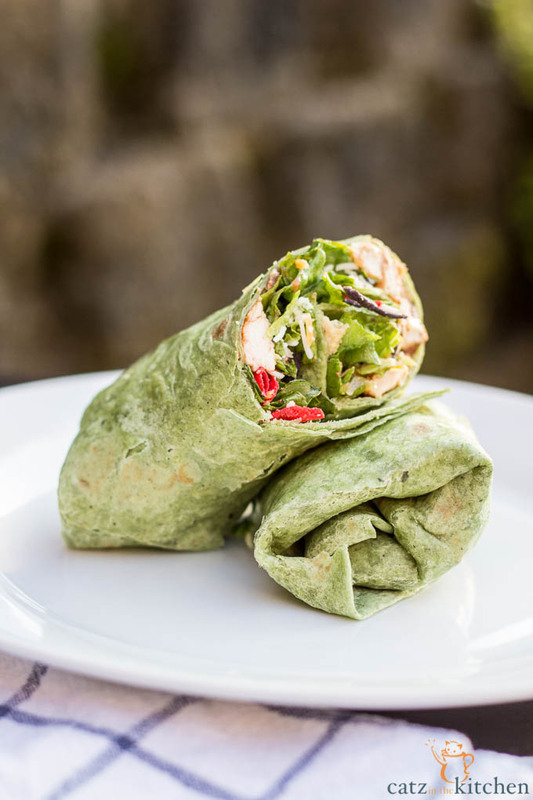 If you have, one item undoubtedly caught your eye – the Whiskey River Barbecue Chicken Wrap. If you’ve never tried it, order it the next time you’re at Red Robin – you won’t be sorry! In the meantime, though, we’ve been working on an imitation to share with you, and, if I may say so myself, it’s pretty dead on. We didn’t try to recreate Red’s Whiskey River Barbecue Sauce – that’s some secret recipe of theirs, and while it’s very tasty, I’m just as happy with Sweet Baby Ray’s (which, coincidentally, just won The Daily Meal’s barbecue sauce taste contest). This was probably one of the easier “imitation” recipes that Chels and I have ever done, and now we make it all the time! The key “barbecue” element of these wraps is the barbecue sauce, so if you’re not in a position to grill the chicken, it’s not the end of the world. That being said, however, if you can, do it. The last couple of times we’ve made these for dinner, we’ve marinated the chicken breast in barbecue sauce for at least two hours and then grilled it over charcoal while basting it with additional barbecue sauce. I like to get a good, dark sear on the chicken breast first over direct heat to really caramelize the barbecue sauce, and then let it cook through over indirect heat so that it stays nice and moist inside. Serve with chips, or, better yet, serve them Red Robin style – with steak fries! The hardest part of this meal? Learning how to properly roll a wrap (at least, if you’ve never done it before!). 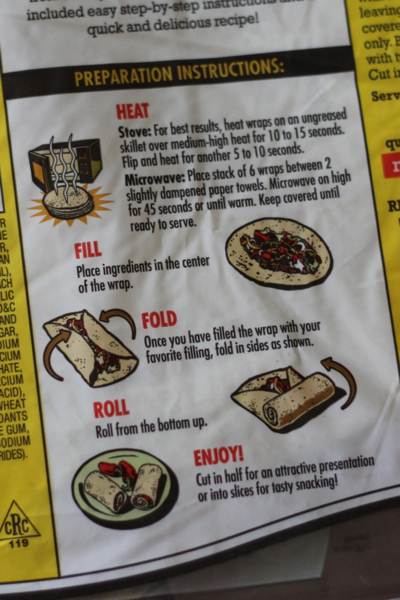 I learned several years ago from the back of a package of Mission wraps. If you don’t have Mission wraps available, here’s the snapshot that taught me! Craving one of Red's excellent BBQ chicken wraps, but lack the cash or time to get one? Solution! Optional step for additional flavor: marinate chicken breast in barbecue sauce for 2-3 hours prior to grilling. Preheat grill to medium heat. Grill chicken breast until cooked through, basting with additional barbecue sauce while cooking. Chop chicken breast into small pieces. Heat wraps one at a time on a skillet over medium heat for about ten seconds. Remove wraps to prep surface, spread 1 tbsp of ranch and 1-2 tbsp of barbecue sauce on the wrap, top with one quarter of chicken, one quarter of cheese, one quarter of tortilla strips, and one quarter of lettuce. Roll up wrap, cut in half, and serve immediately. So I was searching for copy cat recipes for Red Robins whiskey river chicken wrap and came across your recipe. This was last week. This recipe is so similar and so DELISH that I have already made twice!!!! Thank you!!!!!!! Thank you so much for commenting and telling me that you enjoyed it! 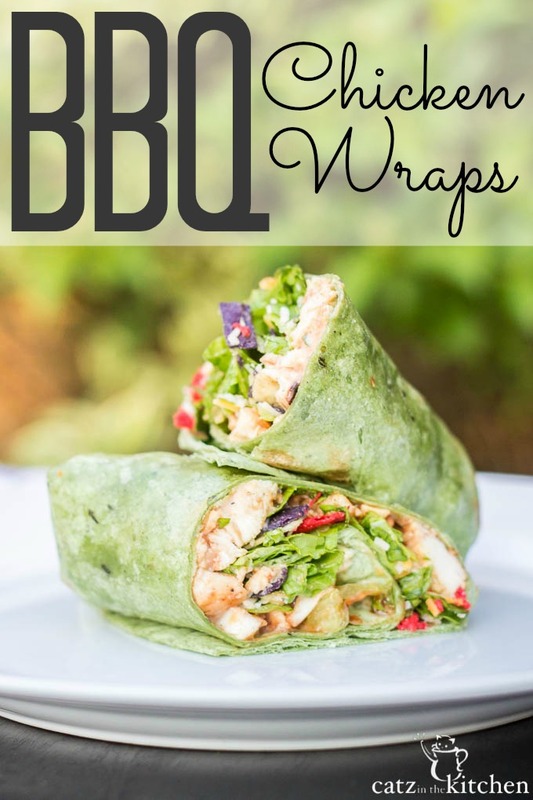 This is one of our favorite wraps too! In fact, I should put it on the weekly menu for next week! Thanks for stopping by! OMG! I am SO glad I found this post. I absolutely LOVE their BBQ wrap. It's the only thing I will order from there(I don't eat beef or seafood). The only thing I did differently was add a bit of tomato. Cest' bon! I had THE HARDEST time rolling it, so I gave up and just ate it. lol I will def be making more of these. have you ever made them with cabbage/slaw instead of lettuce? just wonder if that would make it taste off. These were amazing, a hit with everyone. Cooked my chicken in barbecue sauce in my instant pot. Then just put it on my grill pan for a couple minutes with extra barbecue sauce. Definitely saving this one! Love your weekly menus also.